In Psychology, Maslow’s Hierarchy of Needs, often depicted as a pyramid, is a theory explaining people’s motivations to achieve certain needs. This concept revolves around the notion that some of these needs take precedence over others. 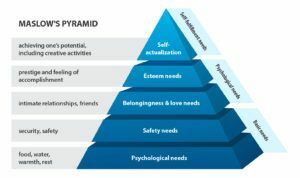 Our most elementary need is for survival and is the earliest motivation of our behavior; once that need (or pyramid level) has been fulfilled, we can move up to the second tier of needs. This process of behavior motivation continues on all the way to the pinnacle of the pyramid – what Maslow described as self-actualization or the desire to achieve the “ideal self”. For example, someone living in an environment without food and shelter won’t care too much about feeling a sense of accomplishment as their main objective is just to fill their bellies and find suitable shelter in order to survive the night. Our basic needs come first. At the end of the day, we can survive without intimate relationships and a sense of pride but can’t survive without water, warmth, and a safe place to rest. The principle behind Maslow’s theory can easily be applied to other sectors of life and business such as healthcare. Every healthcare facility has a set of necessities in which they can prioritize into different categories of importance. The needs that are considered the most essential to patient care and day-to-day operations are the ones that are going to take precedence while the others, though still important, may be less of a priority. The Location Adoption Model understands this hierarchy and provides a solution to help healthcare facilities meet their most imperative visibility needs first while simultaneously providing them a road map to address others later down the line. Much like the structure of Maslow’s pyramid, the Location Adoption Model indicates that the most fundamental component of enterprise visibility is presence detection. Is the person or equipment there or not? Only once this basic visibility need is met, can more advanced location wishes such as clinical-grade or sub-room level certainty be achieved. How can you tell where in a specific room a piece of equipment is if you’re not even sure it is there at all? Healthcare enterprises that are looking to dip their toes in the water and utilize location technology may find that the easiest place to start would be segmenting their facility into clinically meaningful zones. This would allow for basic use cases such as asset tracking, which enables some visibility into the location of critical equipment. Further up the pyramid, more insight and efficiency would come from implementing clinical-grade visibility technology. In comparison to limited certainty which breaks down the facility into estimated zones, the ability to accurately define exactly where a patient, staff member, or asset is located becomes much more meaningful. This more granular look into location is enough to take a simple use case like asset tracking and transform it into asset management to support PAR-level management and utilization reports for improved processes. Finally, at the pyramid’s peak we find the self-actualization of location visibility: Enterprise Location Services. This offering supports high velocity updates and sub-room level accuracy across the entire healthcare facility. Leveraging multiple technologies, Enterprise Location Services allows for the seamless operation of many use cases and applications used to improve operational efficiency and the quality of patient care. To learn more about the various healthcare applications enabled by Enterprise Location Services, download our handbook.